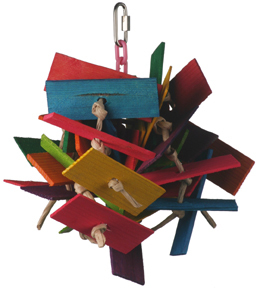 The Scrambler has a plastic chain center, and paper rope legs filled with 1.5" x 4" colorful, thinly cut soft pine. There are lots of knots and chewing fun in this toy. To make it a bit more challenging and to encourage foraging, open up the paper rope and put in a hidden goodie (like a nut) and wrap it back up again. There is a nickel plated pear shaped quick link for easy hanging!